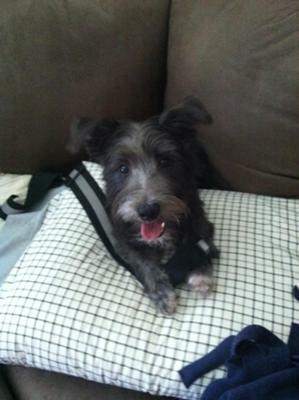 Maverick is an 8 month old Mini-Schnauzer with a little bit of westie in him. He made sure I recognized him when I purchased him by pushing the two other puppies away in his crate. He knew we would be perfect companions! He loves to play and run around the back yard. If it's a nice day out he is happy to lay on the back porch watching the animals. He loves to find small corners to curl up in and does not like beds, only pillows or blankets to put his head on! I don't know what I did before I met him!